We were a bit tired of Android, but realized after trying out Windows Phone 8 for 2 months that Android is still a bit better. 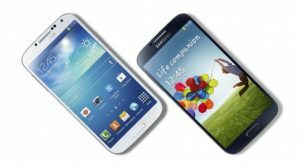 The Galaxy S phones have been Samsung’s flagships during the last few years, and their absolute bestsellers. They stopped Apple’s iPhone to conquer the world completely. The Galaxy S phone’s don’t dissapoint too much. They are leading on specifications and has the newest Android version. Still, Galaxy S1 and 2 are good phones for an average user. And Galaxy S 3 can absolutely compete with iPhone5. But (almost) everybody has waited for the next big hit! And that supposed to be the Galaxy S 4. And Samsung does what people want! They dont launch a simple S model or anything like Apple often does… They launch a completely new phone. The specs look amazing! It will come with a 4.99″ screen, that is as close to 5″ as you can get! The screen resolution is upgraded from 720×1280 to 1080 x 1920 pixels, that is true FULL HD, and we are impressed. This is like your 55″ flat LED TV in your living room! The weight is still only 130 grams, 3 grams less than Galaxy S3, and 0,2″ inch bigger screen. The battery is 2600 mAh instead of 2,1 mAh on S3. The camera is also updated from 8 to 13.2 megapixel, that means a resolution of 4128 x 3096 pixels! Of course it has got autofocus, LED flash, Dual Shot, Simultaneous HD video and image recording, geo-tagging, touch focus, face and smile detection, image stabilization, HDR, everything you expect on a Galaxy S phone, right? The speeds are also worth to mention: It comes with doubled HSDPA speeds compared to S3: as much as 42.2 Mbps; and the 4G LTE with Cat3 brings 50 Mbps UL – 100 Mbps DL! The processor that will run the entire horse has CPU Quad-core 1.6-1.9 GHz Cortex-A15 & quad-core 1.2 GHz Cortex-A7, so that means the best processor ever made. It has also got the best browser on the market for HTML5 and Flash support. This is definitely the best phone on the market, and we really look forward to test this phone in the near future. The Galaxy S4 has got the same hype as the iPhone launches normally do. This is really good for the consumers. There really is competition out there now! Somewhat lol #galaxy2dworld RT @miggymiggs1: Is the Samsung Galaxy S4 the best phone ever or what?!? Is the Samsung Galaxy S4 the best phone ever or what?! ?